After a long ride from Fort Myers we arrived at the garden of John Kinnebrew, sen. in the afternoon. John was expecting us sitting in the shade of a large tree and acclaimed us after we got off the car. Werner visited John last year. 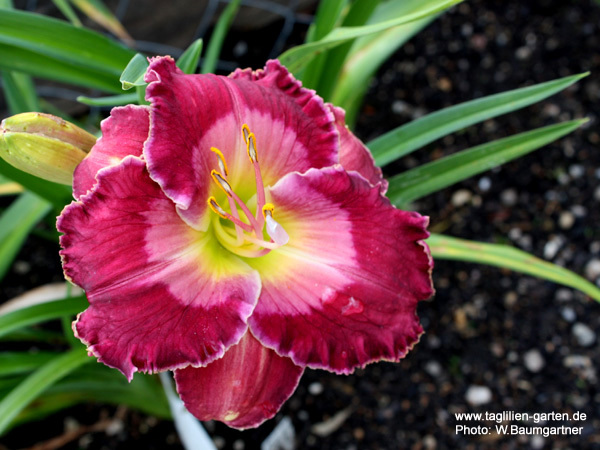 For Manfred this was the first daylily garden in the U.S. in full bloom. Therefore, he asked a lot of questions to John who answered patiently. 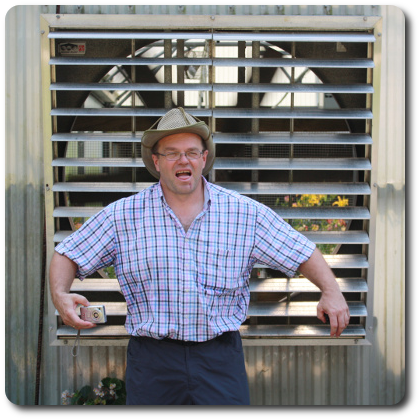 John who hybridizes since about 30 years used to work in the aerospace industry. His son works for a company that develops the next generation space shuttle. The launch of the "Endeavour" planned for this week was unfortunately delayed to May 15. To late for us to watch. 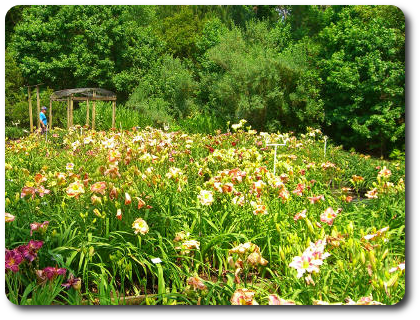 The Kinnebrew daylily garden is in good shape, however not optimally cultivated. 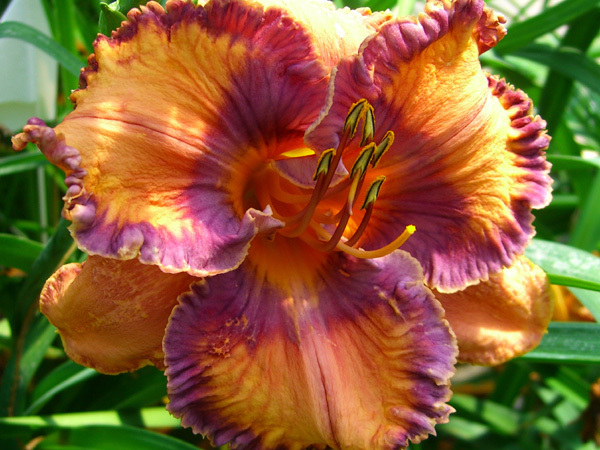 Especially the seedlings showed signes of daylily rust. It is difficult to care for such a large garden; John, jun. is busy with his job, John, sen. has health problems and John's wife Marjorie passed away suddenly in August 2009. Despite the hot weather the blooms were in good shape also in the afternoon - better than we expected. We were invited to see the latest seedlings which we were also allowed to take pictures of. It is really impressing to see what we can expect as future introductions. We can expect great introduction especially with teeth in the future. The more you see the future the less easy it is to pick from the current cultivars. I'd prefered to take the latest seedlings with me but I had to take what was for sale. 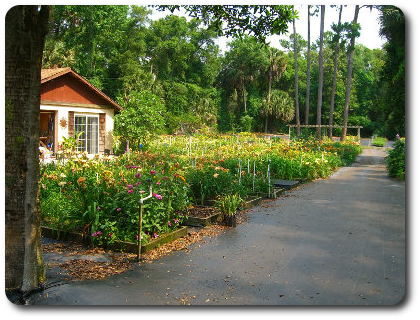 Compared to the other hybridizers' gardens Floyd Cove is a professionally administered nursery. Everything is cultivated and very well laid out. 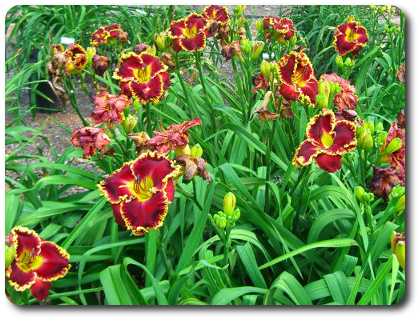 Guy also seems to have the magic recipe for fertilizing daylilies. 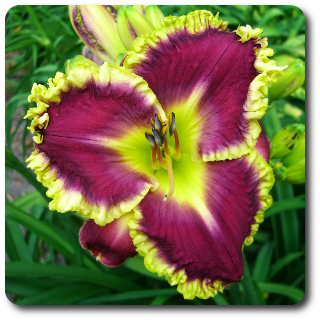 Nowhere we saw daylilies grown so well and strong- extra big fans. Other hybridizers also confirmed this to us. In addition, bloom colors looked stronger. When we arrived in the morning Guy was still busy hybridizing. New cultivars seem to get produced here like on an assembly line. 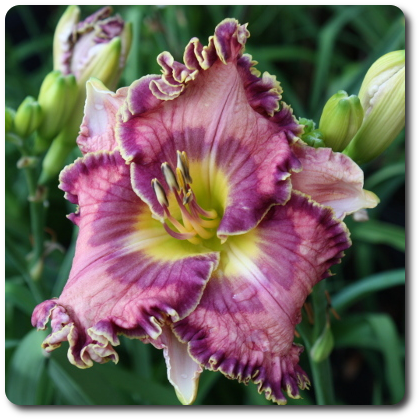 We especially noticed his new dark seedlings with chartreuse ruffles as well as his blue eyed seedlings. 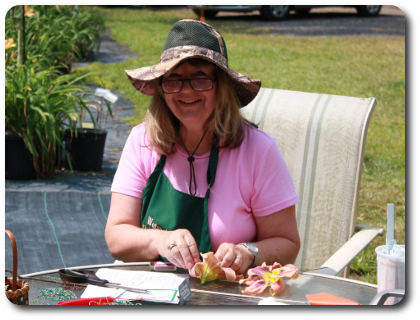 We started early in the morning to visit the garden - or to better say nursery - of Karen and Guy Pierce to see the dayliliy blooms in their early and fresh stage. In addition, we wanted to avoid the heat, because temperatures above 30° C (85° F) were forecasted. Karen cordially welcomed us and showed us around. She explained the layout of the nursery so that we could proceed to our points of interest. Karen and Guy took over Floyd Cove from Stamile who moved to California. 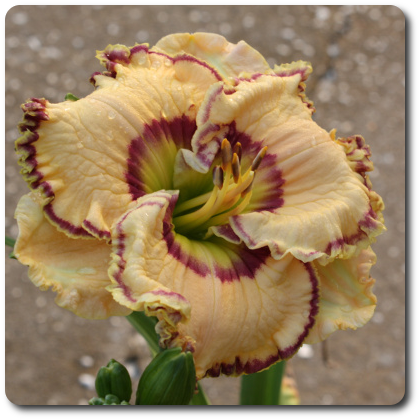 We heard gossip that he'll continue hybridizing there. Dan Trimmer recovered well from his surgery last year. He was busy serving customers when we arrived. As he told us he reduced his activities to a degree that it continues to be a pleasure but not hard work. This is also the reason why he does not ship to Europe anymore - too much hassle with inspections. His new introduction "Carrot Cake" enthused Manfred immediately because of its ideal combination of carving, ruffling and bright orange color. It is interesting to watch that pollen is collected in a matchbox at Water Mill Gardens. We could only briefly talk to Phil Reilly because he was not of best health. 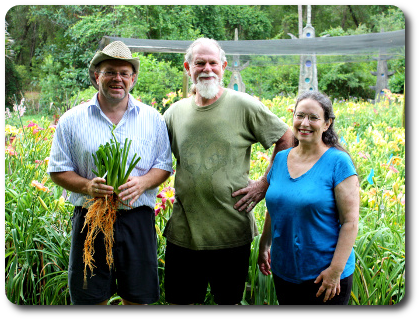 His wife explained the garden to us and showed us the latest introdutions and seedling. 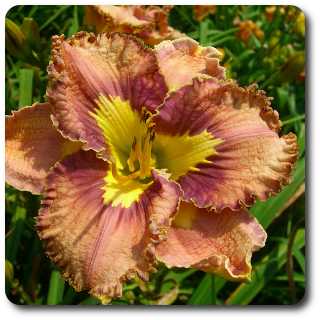 Although Phil is very recognized as a hybridizer, his cultivars and seedlings did not look very spectacular. He is mainly focused on good plant habits and branching. Unfortunately, "Code Blue" was not yet available for sale. In addition, it did not bloom that day. "Code Blue" is a registered cultiver but due to the fact that animals devastated the bed there are not enough plants available for sale. 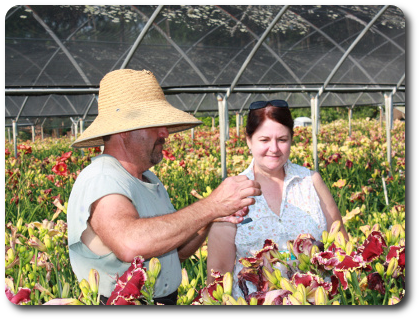 We visited the young hybridizer Nicole (below 30) first of all in the morning in Apopka. 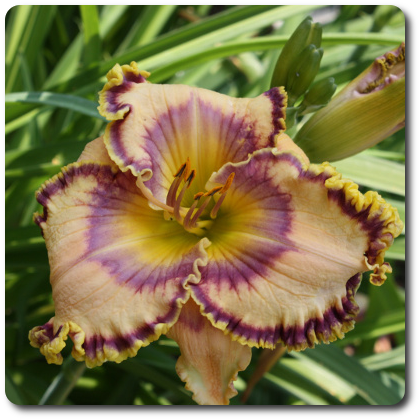 Nicole offers a large selection of daylilies of different hybridizers and of course her own introductions. We could not identify a certain hybridizing goal in her seedlings. However, there are many beautiful seedlings that justify a visit next year. Nicole invited us to her annual breakfast on friday this week but on this day we already were on our way back. Nevertheless, she gave us "Nicole's Thank You" that was intended as a gift for all breakfast vistors. 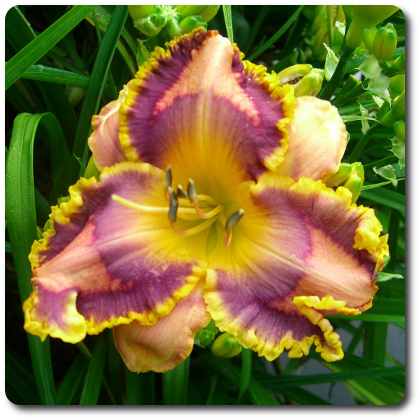 The original plan was to see Frank Smith Daylilies next because it was only 5 min away. 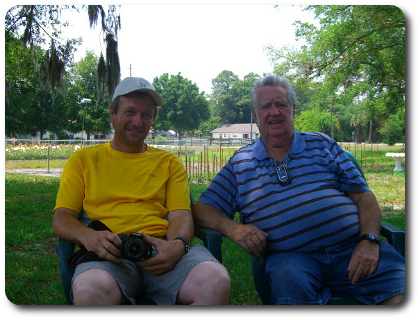 However, it is long ride to Gainesville (Salter and Petit) and we decided to go to Frank on the next day. We debated whether we should write about Salter at all because we were very disappointed. We arrived at his garden around noon time without an appointment. Nobody was there but this fact did not prevent us from strolling through the garden. 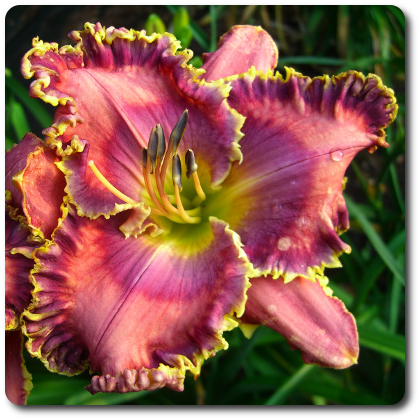 Between the weeds we could recognize single daylily blooms. It looks like this garden is not very well cultivated. What a shame because there were so many promising seedlings. Only the greenhouse seemed to be in good shape but we could see the interior only through the fans. Disappointed we continued our trip to Petit Jardin. Susan welcomed us upon our arrival and told us that the story of our "Flower Power" tour already got around. How did it come to that name? 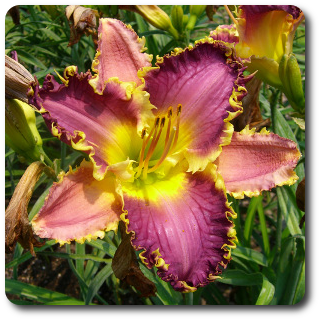 Natascha, Werner's daughter, is in contact with Susan via email and announced our daylily tour to her some weeks ago. Lacking better words she called our visit to Florida "Flower Power" tour. Literally translated it is true. 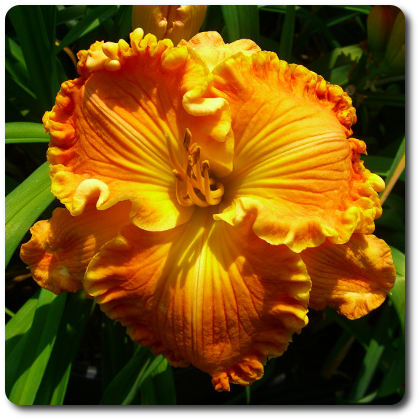 We travelled to see the daylilies in full bloom. And visiting 9 hybridizers in 4 days is realy a power tour. Only the combination of the words flower and power creates a new meaning. However, Le Petit Jardin is also not small. Because Werner knows the Petits since quite a while and has visited them several times, we were welcomed like part of the family. 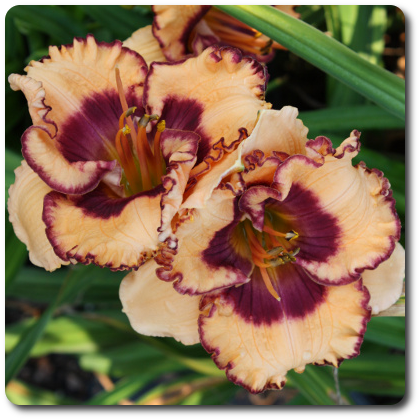 Ted showed us his greenhouse with his latest seedlings and explained his plans regarding hybridizing patterned daylilies. Later we sat in the shade and inspired each other in a discussion about edges and teeth. You may remember that we reported how Pollen was collected at Trimmer's: Ted takes the complete flower (without the pistil), places it on a flat dish with water, and puts them in the refrigerator. Pollen can be kept fresh that way for approx. 2-3 days. 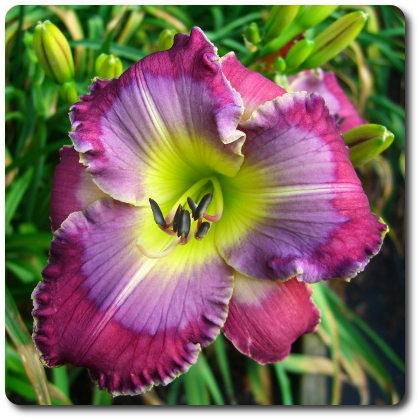 If you love blue daylilies you have to go to the Lambertsons. 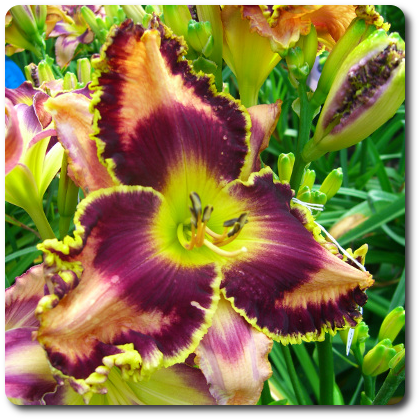 Nowhere you can find such a great variety of daylilies with blue eyes and edges. Manfred was already in contact with Rachel via email since quite a while. She was glad to put a face to a name. The garden stands for its name "Art Gallery Gardens". 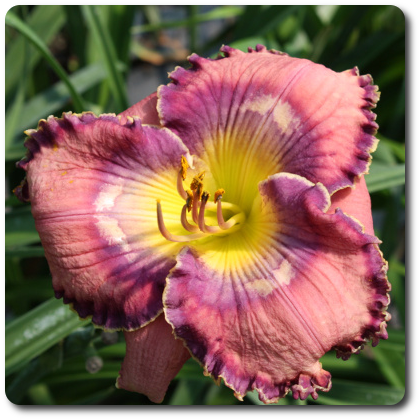 In addition to the regular daylily presentation and seedling beds there is a designed part with landscaping, waterfalls, ponds, oriental pagodas and garden sculptures. Luddy is painter and sculptor; Rachel is a singer. 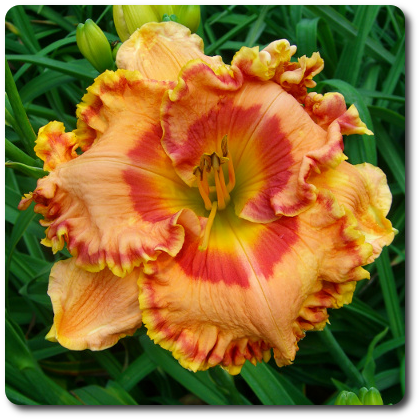 For Luddy hybridizing daylilies is also an art. 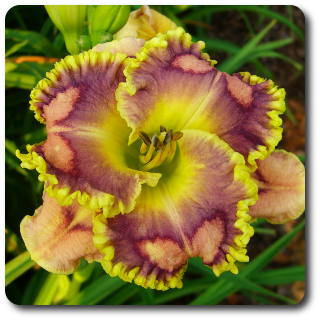 On his home page he calls hybridizing "genetic painting" and views the plants as canvas for hybridizing. Luddy explaining his latest seedlings where he added chartreuse ruffling and teeth to the blue eye and picotee. In addition, there are some seedlings with stronger color. 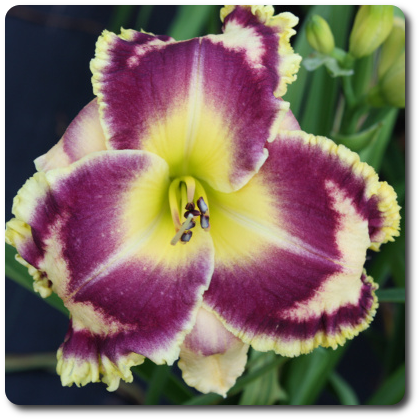 Werner dared to compare Luddy's new introduction "Dream Window" with Nicole's "Dreaming out Loud" but Luddy disabused him and explained that these cultivars are totally different categories of hybridization. 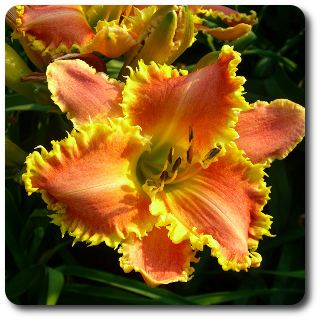 Upon arrival at Frank Smith Daylilies we were greeted by Pete Harry, Nicole's father. We were not surprised because we already heared the rumours that Frank Smith sold his nursery to Pete. Ted Petit confirmed this to us the day before. 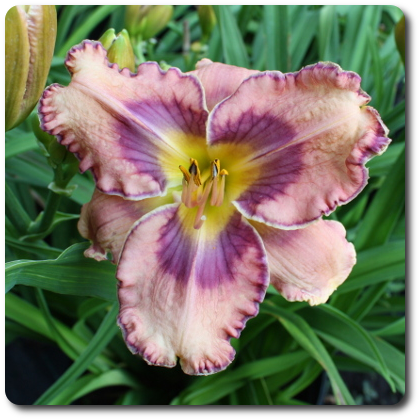 Frank Smith daylilies is very tidy and geometrically structured. Everything was labelled professionally. Maybe, the reason for this is the new owner and the Barbecue planned for next Saturday. Pete guided us through his seedling beds and passionately explained his hybridizing program to us (or is it Frank's program?). It looked like his current focus was on strong scapes with a high branching count that we never saw before. However, some of the flowers were very close to the foliage or even in the foliage. But Pete was aware of it. Also with regards to colors and forms (ruffling) you can expect some spectacular introductions in the near future. 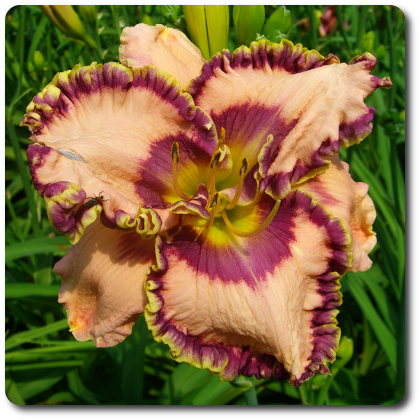 Pete called a "Happy Happy" seedling with strong colors and heavy ruffling "Happy Happy on steroids" (unfortunately no picture) - although to the point this will not be the final name. Many thanks to all hybridizers in Florida for their hospitality! !